Friday night is Bretzel night, and I already look forward to tonight’s meal of freshly made Steak Tartare (beef Tartare), fresh hot Bretzels and a crisp cucumber salad. Followed by Crème Brulee and a glass of Bubbly. This, my friends, is happiness. OK, we do not have Bretzels and Tartare every Friday, but tonight, we do. Is it time yet? 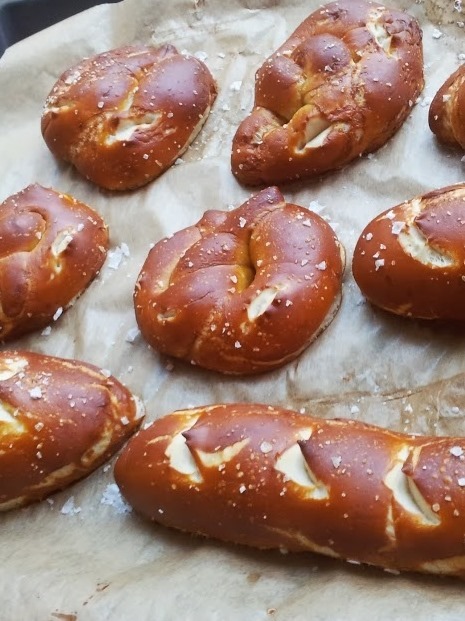 I’m talking about real German Bretzeln, soft and savoury and fresh from the oven. Very moorish. 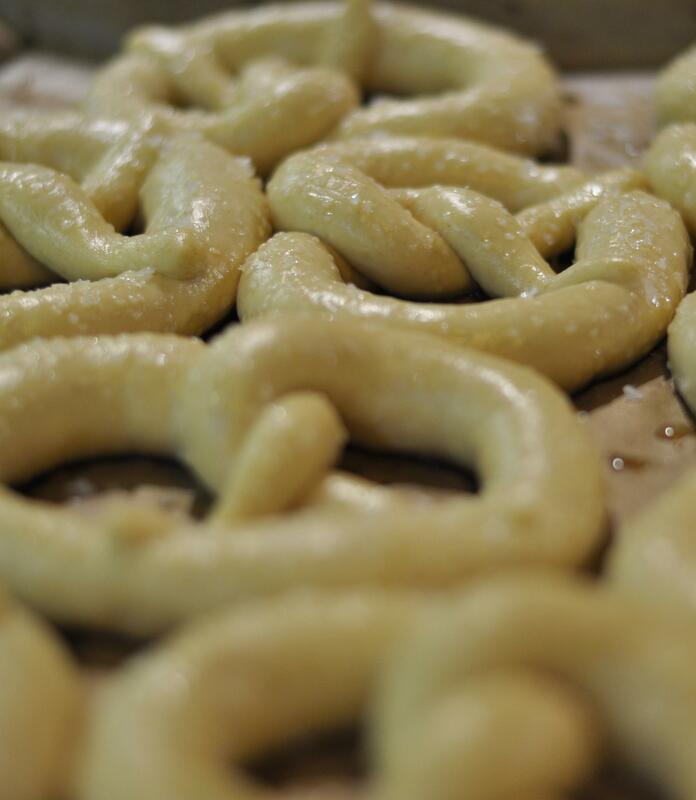 Click here for the Bretzel recipe. The perfect accomplishment to Steak Tartare, or to cheese, or just a knob of butter, or simply nothing. New recipe invented, cooked, sampled and found delicious: a scrumptious goats’ cheese tarte with gremolata, beetroot and caramelized onions. At long last, the Tarte Flambé recipe is written up and posted on food.gauweiler.net. All along with the not-so serious Tarte Flambé for Dummies booklet which I made some while ago for a friend. Kippers ‘R’ Us today, with this lovely new Kippers Salad. 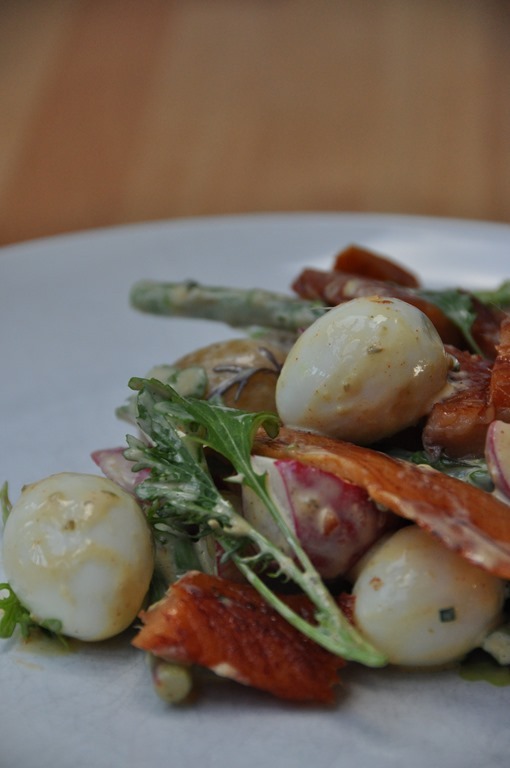 A base from young potatoes, radishes and asparagus in a rouille dressing with boiled quail eggs and smoked oily fish. We used Kippers (Scottish smoked herring), but smoked Mackerel or similar smoked oily fish would also work. The full recipe is here: Kippers Salad. Check it out. Happy Christmas and happy holidays to everyone! 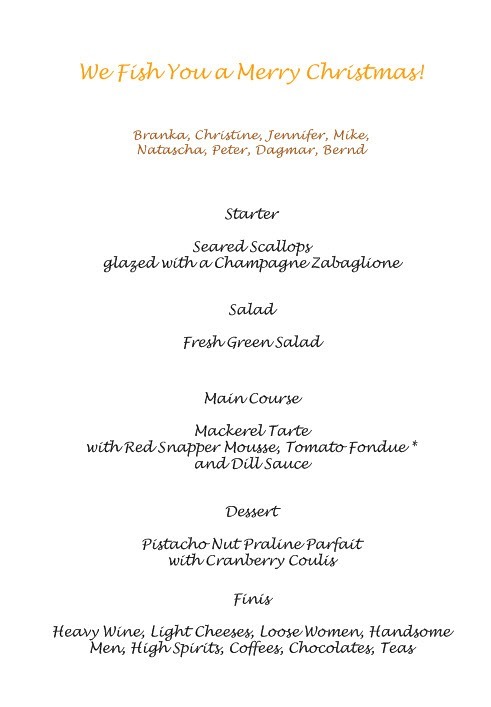 Curious readers may click here for a PDF version of our 2013 Christmas Menu. We find it funny that Nigel recommends a fish and seafood Christmas in this past Sunday’s Observer, but I assure you that our decision was taken much earlier. You find recipes for most parts of this meal on our new food site (food.gauweiler.net). The scallops, the mackerel tarte, the parfaits. Turns out there is only so much time in a day, so this blog is falling wayside a little. Not abandoned just yet, it’s still twitching now and then. Just in case anyone has been wondering what we’ve been up to in the world of vanity digital self-publishing, you might want to check out food.gauweiler.net, a new site of our favourite food, focussed on recipes and the missus’ related photos. This week, I’ve been mostly eating Laugenbretzeln. Knead. Knead thoroughly for gluten-rich hearty results, knead quickly for the brioche-like more fluffy variety (the one using milk and water). Form pretzels or rolls right away, then let sit and rise for 10 minutes. Then on with the goggles and protective gloves, and dip the dough pieces into the lye, simply in and straight out again. Place on a tray and let rise for another 30min, sprinkle with course salt, make small nice cuts and bake at 200C for 20min. Meanwhile, use a funnel to return the lye to a glass bottle, as you can use it over and over again. I made this so often, I forget that many people have never made one, and some haven’t even sampled it. It’s delicious, and very easy to make. There’re no excuses not to rectify either. You need a pint of whole milk, a vanilla pod, six eggs and 250g sugar. You also need two saucepans, a mixing bowl, 6 ramekins and a 2” deep roasting tray or flat-bottomed Pyrex dish. I prefer the slightly conical aluminium ramekins, but you can use the popular ceramic ones, too (those might need an extra 5 minutes cooking time though, due to the thickness of their walls). Put half of the sugar into a saucepan, dissolve in half a cup of cold water, and bring to the boil. Simply let it cook down into a light brown and bubbly caramel. Don’t stir too much (it will only encrust the saucepan’s walls with sugar crystals), but remember the saucepan and its contents will be superheated at the end. Don’t lick the spoon, don’t stick your finger in it. I’m serious. Meanwhile, take the seeds from the vanilla pod. Put the seeds into a mixing bowl. Bring the milk, with the pod (minus the seeds) almost to the boil and keep it there. Put the kettle on. Some add cream to the milk – don’t. You’re making Flan, not Creme Brullee. Add the second half of the sugar to the vanilla seeds and mix well so that the moist vanilla seeds don’t form lumps. Then add 4 whole eggs and two extra egg yolks. Whisk briefly. Place the ramekins into the Pyrex disk, and add a the boiling water into the dish, setting the ramekins slightly afloat (so that they preheat in the hot water). 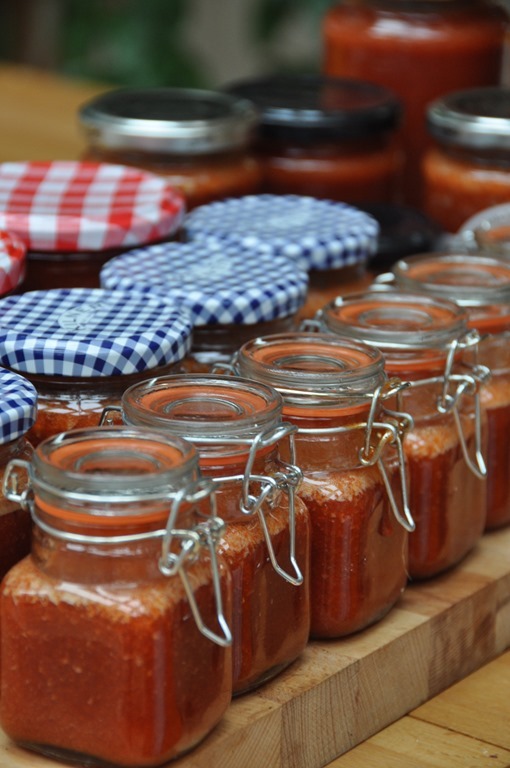 When the caramel is ready, distribute over the ramekins (you’ll end with a think layer covering the bottom of each). Now whisk the hot milk into the egg mix, and distribute this into the ramekins. Put into the oven, set the timer to 45”, and clean your dishes and pans. 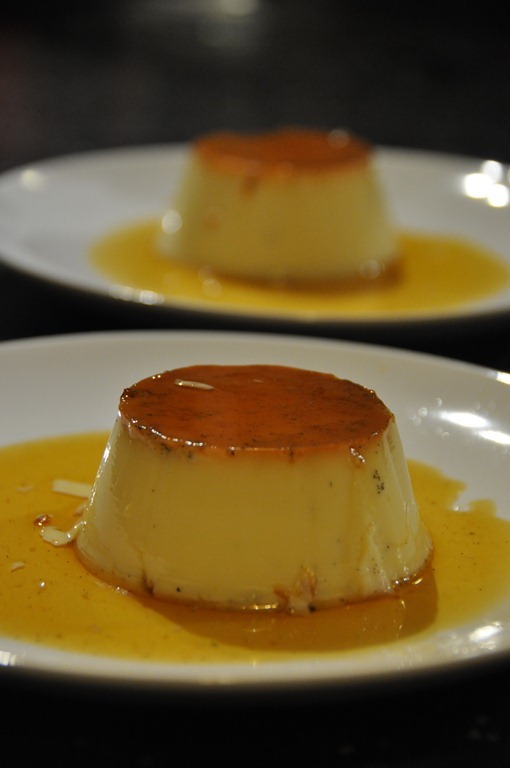 The flan is cooked after approximately 45 minutes. You’d want the top just beginning to get golden. If it’s too pale, it isn’t set yet, and when it’s too dark, it’ll be too dense. When done, remove the ramekins from the water and let cool down, then cover with cling film and chill for at least 3 hours. To serve, put around the edges, flip over onto a plate, and shake until it surrenders and pops out. No extra decoration necessary, just a spoon and a bit of finger-licking. In case you’re following my (almost) daily dinner announcements over on Google+, you may have noticed a new and pretty popular dish on our menu: a pan-fried filet of white fish with a ragout of potatoes, onions and mushrooms, and sauce vierge. I think it pretty easy to make, and very rewarding. The reactions so far have always been very positive, so I feel confident to say that you will love this. If you’re using dried mushrooms, get them soaking at least 6 hours before the event. Use a 1:1 mix of hot water and cold milk, add the dried mushrooms, and stir occasionally. For fresh mushrooms, use Girolle or Cep, or maybe dehydrated Portobellos. Or leave them out; I find the ‘shrooms add depth in flavour, but they aren’t essential to the dish. Next, as far ahead of the event as you like, steam some waxy potatoes. I scrub them clean and cut out all the little oddities, but leave the remaining skin on for a rustic appearance and extra flavour. Steam them in a closed lid pot with 1/2pt water, a teaspoon of salt and a few cumin seeds and fennel seeds. This takes ~20 minutes. Drain and let cool down. 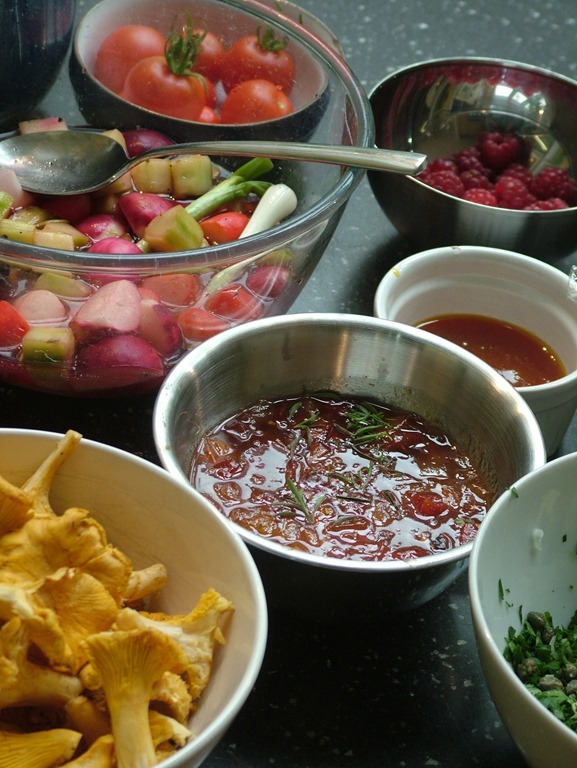 Now, prepare the Sauce Vierge, or my variation thereof – it doesn’t need to be done early, but it can be done early. Something else out of the way, ey? So, take fresh flat parsley, a few mint leaves, and a couple of spring onions or shallots. Wash if you must, but be sure to dry well, and chop finely. Add some chopped capers (I prefer the salted, crispy type, but make sure to remove the salt without rinsing). You could also add finely chopped anchovies, or olives, or other herbs (sorrel comes to mind), depending where you want to take it. Add a sprinkle of sea salt, a tiny bit of nutmeg, a little black pepper. Mix well and set aside. Filet the fish. I use Red Mullet, Sea Bream or Sea Bass. John Dory would also work well, I think. Scale, gut and rinse, then take out both filets. I find it is easiest to cut down the back, along the bones down to the spine on both sides before taking any of the filets off, but the choice of method is yours. Leave the skin on, and try to make stock from the rest of the fish rather than throwing it away. Set aside. Meanwhile, heat another pan (with a little 1:1 butter and olive oil, as before). Toss the fish filets in some salted and peppered corn semolina. This is corn flour, really. Real semolina is made from Durum wheat, but I mean finely ground maize. In Britain, Corn Flour also means corn starch, but I didn’t mean to suggest you should coat the fish in Mondamin – no. Use some nice yellow fine corn flour or corn semolina. I use cooking rings to plate the potato ragout, because they help keeping things together. A portion of the ragout, a fillet on top, and spoon the sauce over the fish and around. Et voila! Pan-fried fillet of white fish, served with a potato ragout and sauce vierge. 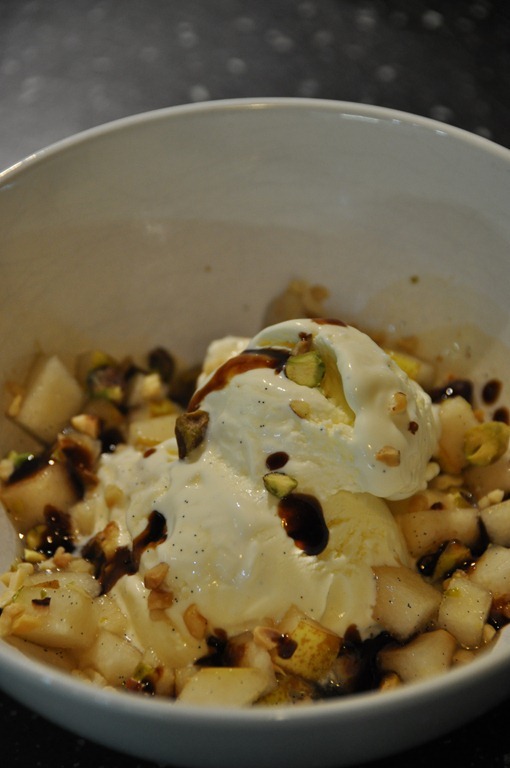 A tangy Greek yogurt ice cream, served with pears, nuts, and a Balsamic caramel. For the ice cream, I make a custard from 250 ml double cream, 60 g sugar, four free-range egg yolks and half a vanilla pod (keep the husk for the pears) in a Bain Marie. Whisk in a paste made from a heaped tablespoon of corn starch, this helps keeping the ice cream in shape later. Whisk in 500 ml of Greek Yogurt in the last few seconds, remove from the Bain Marie. Let cool down, then chill. Churn it just after the main course; chilled well, this only takes about 25 minutes in the ice cream machine. Poach one pear, finely diced, with 50 g sugar, 2 star anise, a sliver of cinnamon or cassia bark, the vanilla husk and 250 ml of cold water. Let it poach and reduce until you have two tablespoons of a thick and very tasty pear syrup. Set aside. Shell, roast and chop hazelnuts and pistachios. For the Balsamic caramel, proceed as with normal caramel, just use Balsamic vinegar instead of water to dissolve the sugar. Then gently cook a caramel (note this will foam a lot more than normal, so be careful), and remove from the heat just when the sugar begins to caramelize. This needs to be timed such that it has cooled down to 40C and a thick honey consistency at the time of serving, but it can also get cold (and quite a sticky mess) and be re-heated slightly for serving. Put a good spoon full of freshly churned Greek yogurt ice cream into a bowl, and surround it with the glazed pear. Sprinkle the nuts over the pears (and some over the ice cream), then drizzle some warm Balsamic caramel over it. Bake, or buy if you must, some nice fresh bread. Now take the knife to the squid: Keep the tentacles, but cut the bodies of three small squid into small pieces and feed to the cat. Now there’s peace in the kitchen again, whining little bugger. Now to the humans: Take four or five small squid per person. Clean. Leave the tentacles intact and uncut, cut the hulls into thick rings, as wide as your thumb. Set aside for a moment. Peel, clean and butterfly three or four large King Prawns (or similar). Set aside for a moment. Bring a pot of water to the boil for poaching eggs, prepare one egg per portion for poaching by gently cracking it into a soft-rimmed dish or flat plate. Chop a handful of spring onions per portion. Crush a clove of garlic, cut a hot red chilly lengthwise, for every two diners. Heat up two frying pans or woks with a generous amount of olive oil – approximately 10mm of oil. Not enough to deep fry, but shallow fry. Toss the squid with a little egg white. One single egg white will be enough for four portions, but don’t borrow “just a little white” from your poaching egg – the poached egg needs the whites to be held together. Now you know why mine broke. Toss the egg white coated squid in the spring onions, then roll them into a mix of corn flour, salt, pepper, and celery seeds. The poaching water should now be boiling and the oil in both pans should be hot, so add a splash of white vinegar to the water, slide in the eggs, and add garlic and chilly to one of the pans. Gently fry the prawns in the chilly-and-garlic oil, the dusted squid in the clear oil, tossing them about occasionally and gently. Very gently stir the eggs once after 30s to stop them sticking to the bottom. The egg should take just under 2 minutes. Take it out with a slotted spoon and drain on a kitchen towel. 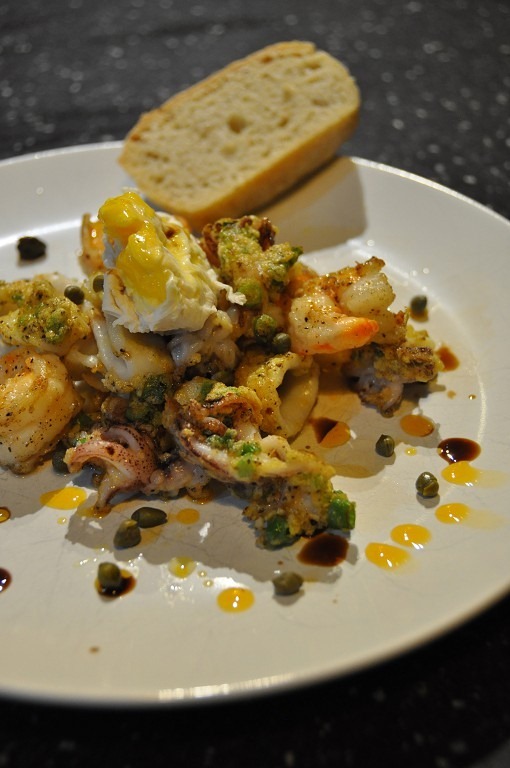 Remove the prawns and squid, drain both on kitchen tissue. To plate, make a nice little mount of shallow-fried squid, add the prawns for decoration, and place the poached egg on top. Sprinkle a couple of capers and add a few decorative drops of Balsamic vinegar and chilly oil. Serve with a slice of bread and a crisp and well chilled white wine, and never look back.